The OS-PAL model has been discontinued. Please see the OS643 as a possible alternative or contact our Temperature Engineering department. The OS-PAL is a non-contact infrared thermometer. 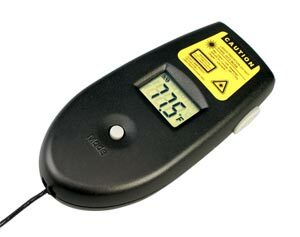 Simply aim the thermometer at the target and press the "Scan" button to display the surface temperature of the object it is aimed. This instrument is not recommended for industrial or scientific use. 참고: Comes with neck strap, soft case, 2 CR2032 batteries and manual.